">The mortar team has two mortarmen, but the weapon suffers from the same problems as the machine gun. The bipod of the mortar should be mounted on part of the same base as the figure. The number two mortarman is a rather odd pose, but when viewed from this side, his pose makes some sense. He is watching the fall of the mortar round. It would have been nice to have a few extra mortar rounds at his side. A size comparison between the Italeri tanker and the HaT German MP. The Italeri guy is just a little bit larger. Look at the great level of detail on even the boots of the Tanker. I don't feel a need for an entire fleet of tankers with Colt .45 pistols, so I suspect I may use him as a source for some head swaps with other troops. Tankers often dismounted for scouting or if their tank was hit. 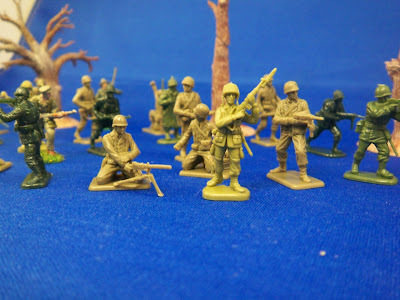 Imex WWII US Army paratrooper from the Easy Company set, Italeri WWII US Army and a Revell WWII US Army soldier. I like the size of the Revell figure the best and the color and sculpting of the Italeri figure best. 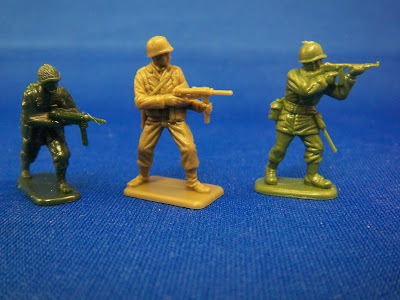 Esci WWII US Army paratrooper, two Italeri US Army figures and a Revell US Army figure. 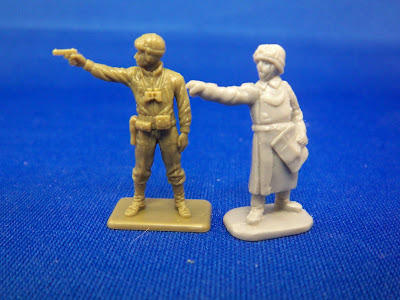 The Italeri US Army set is a bit taller and thicker than the Esci, Revell and Imex figures. They are not so large that they can't blend in okay in a group. This includes figures from all three of those companies. Later this year, Italeri are planning on a second US Army set and an anti-tank set too with US Army and other troops. I hope these two additional sets will fill out some of the missing items in this set. 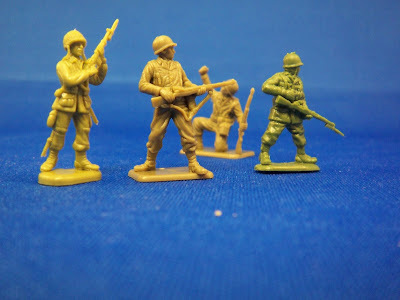 I still plan on getting about a battalions worth of these guys, thats about 16 boxes.